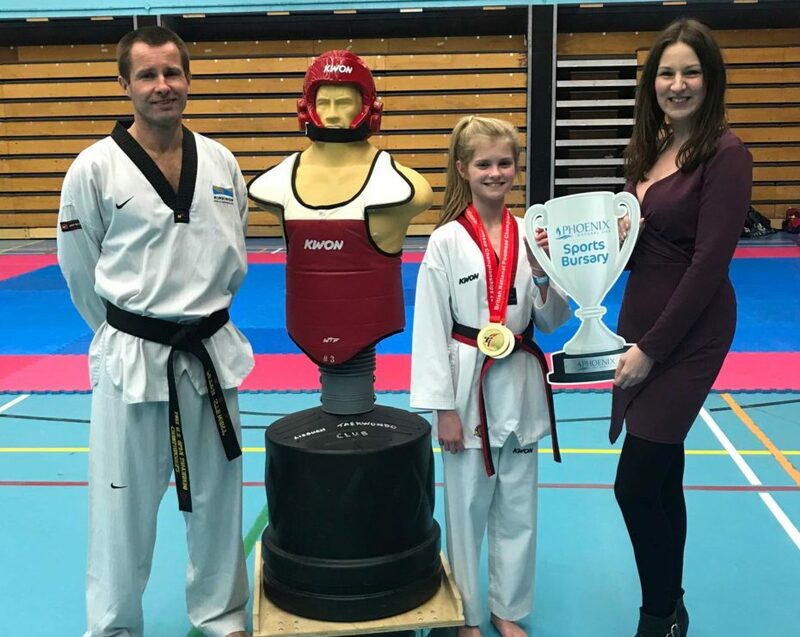 Lisburn teenager, Amy Stewart (13), is celebrating after being crowned British Freestyle Champion at the British Taekwondo National Competition in London recently, following a boost from Phoenix Natural Gas in the form of a sports bursary to help Amy compete at the event. The rising star, who trains with Lisburn Taekwondo Club at the Lagan Valley LeisurePlex, is the first person from Northern Ireland ever to win the title, which requires athletes to perform a routine to music combining high performance Taekwondo with acrobatic action. The complex routine incorporates various kicking styles, as well as a challenging acrobatic move involving one mid-air kick whilst being upside down. Amy has remained unbeaten at every freestyle event through 2018. Taekwondo instructor, Master Peter Stewart, successfully applied for a Phoenix Sports Bursary for Amy, which was awarded to fund travel and accommodation associated with competing in the event. “Amy has been training since she was six years old and thanks to a lot of hard work she’s just gone from strength to strength. In 2017 Amy achieved her black belt Dan grade and has won 23 medals in UK and Irish Taekwondo championships in the past year. “Amy’s recent win a the British Nationals is the peak of her success to date and we are working now on training for the Taekwondo Team GB which will see Amy travel to Hamburg in Germany next month. “Amy is a fantastic ambassador for Taekwondo in Northern Ireland and we are delighted to see her achieve her goals as she works towards her ultimate dream to be the first junior competitor to represent Northern Ireland at the European and World Taekwondo Championships”, said Peter. Geri Wright, Communications Manager at Phoenix Natural Gas, said; “Phoenix Sports Bursaries are open to local athletes who represent their region or country competitively or have the potential to do so, at a national or international level. We are particularly keen to support underrepresented sports and Amy is the perfect example of a young athlete with a very promising future ahead of her who can benefit from the programme. “At such a young age, Amy has accomplished so much already and is making her mark in the Taekwondo arena. We are delighted to help Amy achieve her goals and we wish her every success competing in future tournaments”.